A new e-book of statistics about global wine and other beverage consumption and production has been released by the University of Adelaide and is available as a free download. 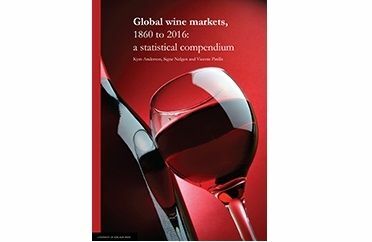 Global Wine Markets, 1860 to 2016: A Statistical Compendium, and the database the e-book draws from, provide a comprehensive range of statistics that are comparable across countries. The new compendium updates the authors’ 2011 e-book, which was downloaded more than 75,000 times and covers the period from 1961 up to 2009. The new e-book not only includes more recent wine market statistics (up to 2016) but also covers other beverages including beer, spirits and soft drink. “Importantly, the update shows how wine markets have recovered since the end of the most recent global financial crisis, says one of the authors, world-renowned wine economist and University of Adelaide Professor Kym Anderson. The added data also communicates the speed of the emergence of new wine markets. “Asia has become an important consuming region, which has stimulated wine production in China. In terms of volume, China already rivals that of Argentina, Australia, Chile and South Africa,” says Professor Anderson. In addition to the inclusion of statistics up to 2016, the compendium provides another century of historical data to enable comparisons between the current and previous globalisation wave. “Until recently, most grape-based wine was consumed close to where it was produced, and mostly that was in Europe,” says Professor Anderson. “The latest globalisation wave has changed that forever. Now more than two-fifths of all wine consumed globally is produced in another country. The e-book and database are expected to appeal to a wide-audience, including those in the wine industry, in addition to policy makers, health professionals and academics. Some of the world’s leading wine economists and historians have contributed to and drawn on the ebook’s database to explain long-term trends and cycles in national wine production, consumption and trade. Their analysis is available in an upcoming book entitled, Wine Globalization: A New Comparative History, edited by Kym Anderson and Vicente Pinilla (Cambridge University Press), available for purchase online in January 2018.